Former club(s): FC Groningen, Go Ahead Eagles, FC Twente/Heracles, VV Lemelerveld. 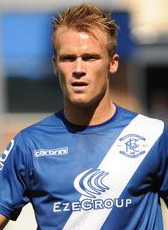 Maikel Kieftenbeld moved abroad in 2015 when he left Cup winners FC Groningen and joined Championship club Birmingham City on a 3-year contract. On the closing transfer day of summer 2017, Kieftenbeld moved to Derby County to sign a contract until 2019. However the FA blocked his last-minute transfer because of administrative reasons and the midfielder returned to Birmingham. The defensive midfielder extended his contract at Birmingham in January 2018 with another two years until 2020.